Hi my favourite squad hope you all are enjoying the plot. Well its a 5 shot ff ..i hope you all know that. Love u all Take care Stay happy. Ragini is getting ready to go to office. Ragini: hurry up maa i am already late. Sharmishta: first you sit here. Sharmishta: beta please its high time..and i think. Ragini: please maa if you are talking about my marriage then i don’t want to talk about it anymore. Ragini: there is nothing left to listen for maa. I don’t want to get married to anyone. Sharmishta: for how long Laddo ? how long you are going to hide from the truth? Ragini; i am not hiding maa. Its just i don’t want all this anymore. Sharmishta: i know that Laddo but how long are we going to waste thinking about it. Its past now beta we cannot change it. Ragini: exactly we can neither change nor forget our past. And one thing is sure i am not going to marry anyone else no matter what. AP: I talked with Laksh but. DP: We have to do it. We have to get him married soon. Laksh: maa if its about the marriage thing then i really don’t want to talk about it. DP; How long are you going to avoid it Laksh? Laksh: i don’t know dad. Maybe till the day i stop breathing. DP; Laksh don’t you talk anything like that again. Laksh: what you both want me to do then? AP: We cant see you like this Laksh. We just cannot. AP and DP are happy. AP: you are ready to marry? Laksh: yes..but i am doing it for you both. DP: Beat you don’t worry we will find a girl who will keep you happy. Laksh: that’s a lie dad. He goes to his room and sit on the bed staring at the wall. Feeling how helpless he was. She rushes from office and reaches city hospital. Ragini: Rakhi di what happened? Rakhi: don’t worry Ragu everything is fine. Ragini: how is she now can i see her? Rakhi: yh she is ok now..but we need to be very careful. Ragini; what happened to her. Rakhi: maid said mumma fainted and she brought her here. Luckily Yuvraj and i was here. Rakhi: Ragu did something happened? Ragini: yh she was asking me to..
Rakhi: then why are you not obeying her Ragu? Ragini; di i cannot marry anyone please try to understand. Rakhi; Ragu because of this mumma is facing so much tension that is why she fainted. Do you have any idea how serious the issue is? Ragini: i am sorry di..
Rakhi: do whatever you want Ragu ..
Ragini: Hi jeeju can you tell me in which room is maa admitted? Yuvraj: yh she is 507. Yuvraj: You need to take care of her and avoid things that gives her any kind of stress ok. It could be dangerous. Ragini: i talked with Rakhi di. Sharmishta: Rakhi doesn’t know anything Laddo ..she i am also a doctor i know. Ragini: maa i am ready. Sharmishta: ready for what? Marriage? Ragini : haan maa i thought about it and i think i should move on. Sharmishta: yes beta i am very happy…thank u .and don’t worry we will find a very nice boy who will keep you happy. Rakhi: Ragu you go home i’ll stay with mumma. 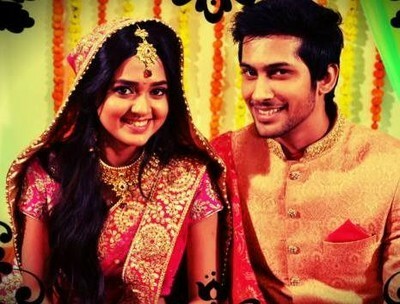 DP: AP a proposal has come for Laksh. DP gives all the details. AP: seems like a nice alliance to me. DP: we have got a proposal to you. DP: and the girl’s name is Ragini. Laksh is shocked to hear the name. DP; What is wrong with her. And how can you say this she is qualified. AP: Dont you have her photo. Laksh: whatever dad. I don’t want to marry her. AP: Why are you rejecting her just because of her name. Laksh; because this is that name which makes me remember her my past.